Getting one’s arse into gear can sometimes mash ‘em up a little. By the time I actually headed off from the campsite and along the three or so miles to get out of Breaks Park, it was already past 8am. Not such a great start time for a 70+ mile day that was to include five significant climbs. Well, they looked big on the map, but those elevation charts are a little deceptive at times. It didn’t take me long to see why he didn’t want to stop. I began a steepish descent, which he’d just climbed, and who wants to stop after just completing a lung-sucking-air ascent? Precious had wet rims from the mistiness of the night, so I was reasonably cautious on the downhill. The stillness of the morning air was interrupted by the far off drone of coal trucks coming from somewhere down in the valley. I saw my first one of the day about 10 minutes later, and they increased in frequency from that point on. Twisty, twisty, down, down, then bam. I had to brake hard to slow down because I’d seen a Welcome to Kentucky sign. Hello, Milestone! Goodbye, Virginia! My first state crossed. No time to sit around and celebrate. Push on, slow poke. On and on the winding descent went, a river somewhere below on my left, hill and rockface to my right. An overlook stole my attention for a tiny while, and I walked a little way down the stairs to take a photograph. I’d maybe been traveling for about 30 minutes, and it was already pretty warm and muggy. And I still had those five big climbs coming my way. Rolling into Elkhorn City, I pulled into The Rusty Fork for breakfast, which had a pretty full carpark. I took that as a good sign and parked my rig between two cars in a space. If you exude confidence, you can totally pretend to be a car. It’s easy. Eggs, coffee, orange juice, bacon, toast as thick as a pizza box. Conversation on the next table was almost unintelligible, but I’m getting better with the accents. As a group of customers left, I saw them gather around Precious outside and gawp at his awesomeness. Someone pointed at Zimmerman. A few of them laughed. I hope they weren’t getting Precious’s back up. He can be fiery to ride when upset. Finally, I took one last long swig of orange juice, paid my $8 and left. Bacon in my belly. Coffee in my bladder. Perfect combination for a big day of climbing. More trucks buzzed by as I noodled comfortably along the flats towards Ashcamp. Some of the rock formations where incredibly layered, like a wafer or a licorice allsort, and this part of the ride was pleasant enough. But it wasn’t long before the first climb raised its hand and screamed ‘over here!’. Legs churning in a low gear, I began to climb through the already sapping heat. About halfway up I stopped for a breather and to record some voice notes. A local on a quad bike pulled up beside me. “It’s leaking now,” I said. We had a laugh and he pushed off, telling me to drink a lot of water as there was a heat advisory. I appreciated his concern. I’d have to say that people have been very nice with their ‘be careful’ advice. Mostly, they’re just saying be careful about creeps. “There’s some crazy people out thar” is a phrase I’ve heard many times already. I’d love to not ride on a hot day, or run into any crazy-arse people, but the thing about the trip is forward momentum. Gotta keep on moving, hellhound on my trail kind of thing. So I kept on moving and slayed the hill. Not too bad. One down, four to go. 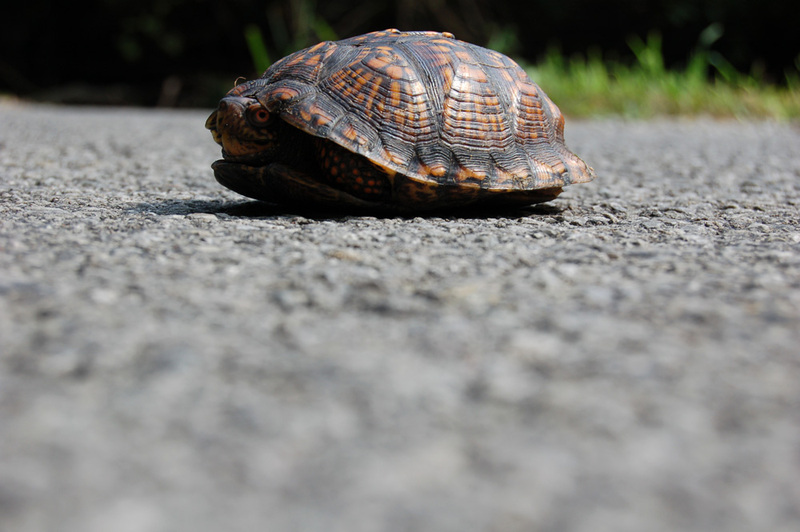 Turning onto a smaller road at Ashcamp, I came across my first turtle playing chicken in the middle of the road. Stopping to take his/her photo, there was a sudden rush hour on this deserted stretch of crap asphalt. I half expected someone to run over the poor fella before I even got a chance to shepherd him across to the other side, let alone take a happy snap. But they all missed mashing him (and me). Somehow, I missed the turn at Lookout and happy whizzed downhill in the wrong direction for about a mile before I realized. I’ve been using the Garmin lap feature to count distances between map waypoints (not using it for navigation – going old school paper maps for that!) Although I didn’t have far to go to get back to the route, it was kinda irritating. I don’t have time for this ‘wrong way’ stuff. The second climb of the day had begun its slow assault on my quads. I took my time. A man in his garden yelled out that I was going mighty slow. “Well, you’ll have a chance to cool down when you hit the downhill,” he said. I would like to thank him for not pointing out just how far away that was going to be. Not that I would’ve stopped (that hellhound thing again), but a little tip would have helped me to gird my loins. Or quads. Or lungs. Or whatever. The grind carried on. I stopped under a tree and reapplied sunscreen. Off I choofed again. And that’s when ridiculous entered the scene. Switchbacks have an honor to them. A system that you can count on. Sharp on the corners, steady grades between to catch your breath. There’s a theory to them – ride wide and avoid the steepest grade (the inside of the curve). This climb did not respect any rules at all. It tore the climbing rulebook up right in front of my eyes. Eyes that annoying little bugs were hanging around. My sweat is obviously delicious! Up. Go straight up, then turn a bit going straight up, then go straight up again and turn up and go straight up. And die. Confession: I walked at least half of this climb. Every now and then, I’d get on and spin up another bit and feel good about myself for a few minutes. And then I’d push Precious and Zimmerman and sweat all over the place. It probably took an hour to get up that hill. The dropoff down the side got steeper and more dense with the green. Many times I had horrible thoughts of accidentally dropping the rig off the side and how difficult it would be to get it back up. And I do mean accidentally, as I’m obviously accident prone and have already fallen over once just trying to get a push off on a steep incline and overbalancing while clipped in. On and on. Coal trucks would smoke by. Cars was roar up. I would keep on walking. Or riding. Or existing. And then, the crest of joy. Honestly, I’ve started taking the downhills at a very comfortable pace just to make them last longer. Time to catch my breath and let the sweat dry. It wasn’t long before I popped out on a busy highway. Wide and shelterless, I zoomed on down. Stopped at a gas station and bought a few more liters of water and some beef jerky. Gulped a coke. Fizzy makes me happy. To my left up in the hills, I could see a mine eating away half the mountain. Time was seeping away and I was getting a little concerned. I still had a long way to go and it was very very hot. And only two mountains down! On the third climb, it started to rain. I was glad of the cooling effect of it, and it never got too heavy. It was three o’clock. I hadn’t even turned over the map to the final panel of the day. I’m so bad at this. But you know what? I made it to Hindman. Knocked off those last two climbs. The sky was looking threatening, and the light was starting to fade because of it, but I made it to Hindman. Victory! However, just as I was coming down the hill towards the town center, the sky burst a pipe and it started pelting down fat rain. I was drenched in about 10 seconds. I pulled quickly into a parking lot and over to a little shack with a porch and pulled up Precious in front of me. I was kind of under cover as I sat on the ledge holding the bike. And then it started bucketing down even harder. Catsanddogsaclysmic. Lightning like crazy, thunder rolling around like a ball bearing in tin can. Precious was getting drenched by the water coming off the awning. I checked around the side of the little shack and decided it was probably more covered, so maneuvered him around there. Immediately, the rain direction changed and it made no difference at all. Standing on the little porch, I dialed the number for the B&B listed. Noticed my phone battery was dying. The guy on the phone explained that it was no longer a B&B and that the only hotel in town had closed 3 months ago. Um. But. Um. Our conversation was conducted at high volume and interrupted several times by the thunder. I thought I heard him say ‘tent in my yard’, but I said I’d call back when the rain stopped. I was about 20 feet away from a second building. The Marie Steward Museum and Craft Shop. Noticed they had a little ramp that went up to the porch. I was already soaked to the bone, so grabbed the bike and pushed him on over and up there for a bit more cover. Now I was completely out of the rain, but things looked pretty bleak. A text flashed up on the screen of my poor dying phone. It was from Zolty. It so weird, this disconnect from the world. The void that I’m in. What is the point of even telling Zolty that? Apart from the fact that he’s my friend and friends complain to friends. But what could he do? Looking back, I’ve been very happy that Precious has been getting attention and that people are interested in it and have been donating, but honestly, all I seem able to focus on is getting from Point A to Point B and not killing myself in the process. I tell you, it’s hard out here for a chimp. But Z did some searching around for me while I sat there watching the earth wash away. Friends are awesome. The sky would light up, the thunder would gurgle and I would shiver. He texted about David, the guy I’d called earlier, and how that was really my only option. Still, my phone was croaking. The motion light came on and I walked along the front of the porch. Holy crap! A power outlet. Dug in Zimmerman’s bag and found the charger and plugged it in. One crisis averted. At about 8:45pm, the rain had dulled to a steady but tolerable shower. I called David at the Historical Society and he explained he HAD a tent in his yard that he rented out to cyclists. (I remembered now: Monica, the cyclist I’d met had told me to call him). He was a block away, but up a very steep hill. And what a push up the hill it was. It wasn’t so much as raining any more, but a mist laid itself all over me and the night. Through a gate I went, pushing Precious on the very tips of my toes and fully stretched out. I found out later that some people have actually ridden up this hill. You know what I say to that? Finally, I got the the top and saw David waiting in the glow of a light. Standing there like some kind of angel holding a glass of icy root beer and a flashlight. I parked Precious on a flat part of his yard and said hello to one of his cats (he had about 10 or so by the looks of it). As we walked over to the tent, he shone a light on the grass and warned me about little poisonous snakes that like to hang out there. Great. The tent was huge and had an air mattress and pillows and it just looked like the most perfect place on earth for one very soaked cyclist. Once I’d unpacked, I headed up to the house for a shower and gave him my laundry (yes, he did my laundry!) It was too late to order any food, and by the time I’d extricated myself from the warmth of the shower and felt human again, he’d made me a baked potato with sour cream, bacon bits and cheese, a jug of ice tea, sliced some cantaloupe, some pumpernickel bread and let me try some cherokee heirloom tomatoes (black tomatoes). I was a bit stunned. Clean and dry, I ate. Then typed up a blog entry. And then he came out with a large bowl of ice-cream with nuts, chocolate syrup, whipped cream and a cherry on top. Ha. It’s hard out here for a chimp. For sure. Keep up the good work. This trip will be one of your best times. Enjoy, make friends, grow strong. Take good care of yourself. DANG ! you choke me up a bit. I hooked up BoB IBEX this morning for a farmers’ market run. Temp approaching 90, do the loop with downhill run or reversed direction with uphill home. After reading this I’ll do the reverse. Reading your journey so tough, so bittersweet yet so rewarding, WOW ! Hi Janeen, like your writing very much. Keep going! Slowly but surely is the way to go. See you had another bagsplosion there on david’s lawn ;-)…. Greetings from Holland. That’s a nice surprise ending to the day! This made me cry. Good grief, Charlie Brown. Wow, what a great ending to a difficult, rainy, stormy day! David dounds like a great guy. Glad you had some good food and a nice comfy bed to sleep on. Have safe travels!